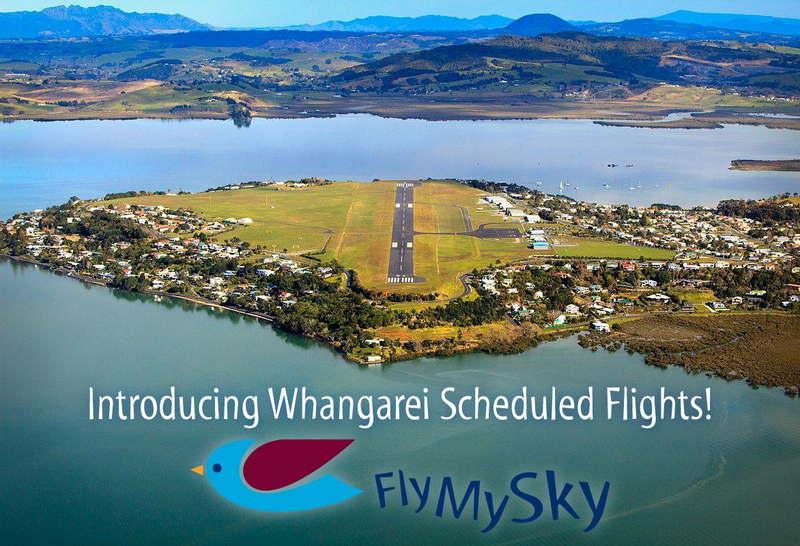 Fly My Sky have announced scheduled flights between Auckland and Whangarei. The scheduled service will start on 23 October 2018 and will operate twice daily Monday to Friday. 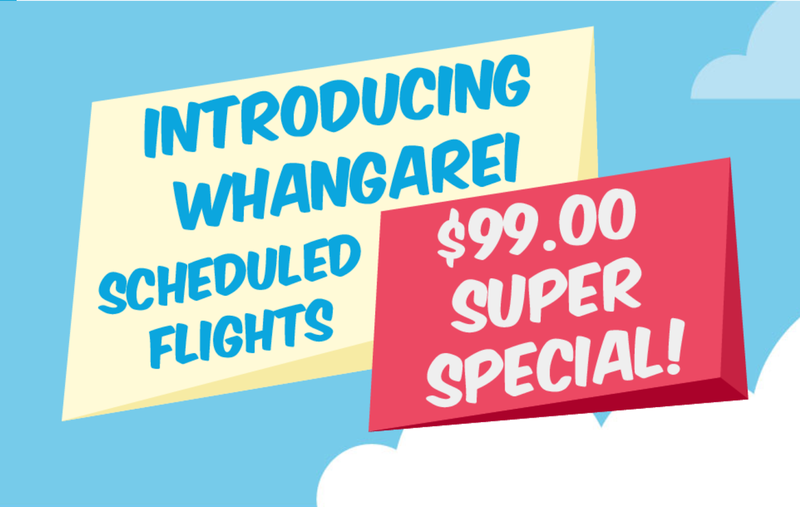 Flights will leave Auckland at 6.55am and 1.20pm with the return service departing Whangarei at 8.20am and 2.45pm. 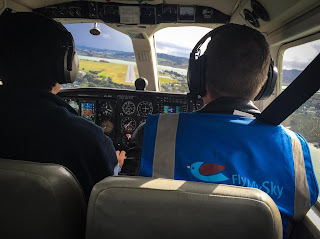 Fly My Sky, a New Zealand owned airline based at Auckland Airport which has pursued and received recognition for safety and best practice over the years, has announced the introduction of scheduled flights between Auckland and Whangarei, starting October 23rd 2018. The scheduled flights will operate return journeys twice daily, Monday to Friday. Fly My Sky General Manager, Grant Bacon, says that the introduction of the scheduled flights will give customers more choice and flexibility of travel time between the two cities. The flight service will operate using Fly My Sky’s twin engine Britten Norman Islander aircraft, capable of transporting up to 9 passengers and accompanying luggage. Grant says that the aircraft, well respected around the world, are known for their great safety record and are a perfect fit for the journey between Auckland and Whangarei. With over 38 years of experience in providing flight services, Fly My Sky has proven itself to be a consistently safe and reliable operator, well known for its daily flights between Auckland and Great Barrier Island. Scheduled flights begin Tuesday 23rd October 2018 and bookings are available online at www.flymysky.co.nz or over the phone 0800 222 123. 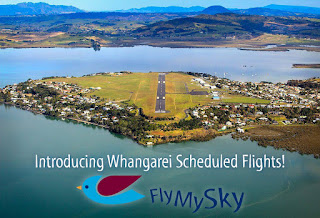 This is not the first time Fly My Sky has operated an Auckland to Whangarei service. Mountain Air, later Fly My Sky, had previously offered a freight flight between the two centres but which also carried passengers. 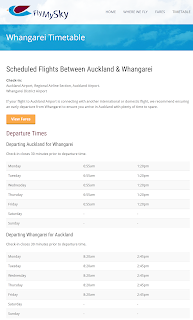 The flight left Auckland at 5.55pm in the evening with the return flight leaving Whangarei at 7.10pm. This service, like a number of such NZ Post courier flights throughout New Zealand, was cut at the end of 2008 as a casualty of the economic recession. It certainly is. Air NZs fares are quite competitive on the WRE sector. I would take a quick hoon on a Q300 then noisey slow flight on a Islander :/ FMS must have reasoning behind the announcement, but bizarre alright! It’s a bit pricey for the leisure market, and regular commuters would far rather go in a pressurised turboprop on a 30min flight, than a rowdy bongo flying down in the weeds for an hour. Yes the odd enthusiast would enjoy it, but it won’t pay the bills. Somewhat suprising that it will only take about 4 mins longer than the Q300 - no coffee available tho unless you take your own! Hardly ever get coffee on WRE/AKL flights. Water and lollies is all they have time for, although they have been including the cookies recently. You won't get a hot drink on any sector that's about 35mins or less, that's there policy. I think AAGS is the shortest flight that has a hot drink. Fly MY Sky should have launched a Auckland to Hamilton route. It might be more popular a bigger city and also that route has no competition. The reason their service ceased was because their contract with the DHB was terminated. The previous poster was referring to the HLZ attempts at a schedule. Barrier flew a mid day service timed to connect with the Kiwi flight from Nelson. Most people would prefer to fly Nelson to Auckland non stop so not surprising the Barrier flight failed. What would be better is to have a early morning HLZ to AKL service to arrive by 8am like what Eagle use to have and a evening return. 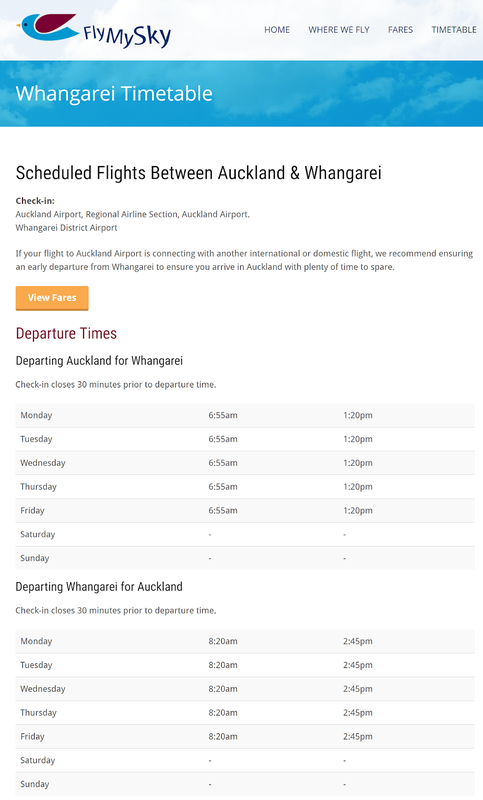 So that pax can connect to all the international flights and allow a full day in AKL for business passengers.